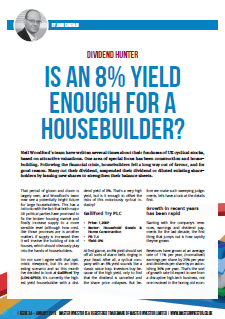 Galliford Try is currently the highest yielding housebuilder with a dividend yield of 8%. That’s a very high yield, but is it enough to offset the risks of this notoriously cyclical industry? Neil Woodford’s team certainly seem to think UK housebuilders are in a good position. That’s partly because both major UK political parties have promised to fix the broken housing market and finally increase supply to a more sensible level (although how credible those promises are is another matter). Of course, if supply is increased then it will involve the building of lots of houses, which should obviously play into the hands of Galliford Try and other housebuilders. However, the stock market seems to disagree, at least in the case of Galliford Try, otherwise the company wouldn’t have that 8% dividend yield. Is an 8% yield enough for a housebuilder? Aha the old housebuilder theme – excellent one to comment on. A bit like the Capita’s and Provident Financial’s and the whatever you want to name – buying at the end of the rainbow cycle isn’t that smart is it? Governments’ of either political spectrum tend to be populated by people who are to put it rudely “non too swift” where economics are concerned or alternatively populated by vested interest groups — how naughty of me to suggest such a slanderous statement. But look at the facts — In 2013 the Help to Buy (HTB) system was introduced which effectively derisked the builders to the tune of 20% of the housing stock they chose to knock out to the first time buyers with small deposits. Conditions on the access to such additional “free” money was the house prices took on a certain rigidity and in fact they soon grew in price to match the additional 20% the government (sorry I mean the tax payer) guaranteed. So consequently the share prices of the housebuilders that had been flat for several years up until that point took off exponentially over the next 4 years. The number of houses built? — about the same — it stimulated the housbuilders directors paypackets (many with links to govenment) like Persimmon’s controversial £100M bonus — obscene one might suggest – ooh not me though eh !! Looking more closely – your point about the dividend hike at the end of the cycle is spot on – up until 2013-14 the company operated with a well covered dividend and since then it’s gone off the scale with cover of many of the builders now close to 1X. Galliford is probably one of the better one’s. Still the key point is the E — the P/E is a meaningless figure when E in this industry gets turned off like a tap and it only takes a quarter or two for it to become apparent. Carillion could be the Lehman moment in building and construction across all the sectors. Since 2010 the government commitment to social housing has dropped from 57,000 units to less than 6000 in 2016. So much for the expansion. Now you have some other simple stats — when help to buy was introduced houses were selling for 30-40% less than today so it was possible to get a 5% deposit from muum and dad and get on the HTB scheme. In the last one hundred years the house price to income (first income) ratio has averaged 3.5X to 4X “FIRST” salary. Given that the current average salary is approx £28,000, that would be something like £98,000 to £112,000 — sadly that would probably just about get you the garage and the downstairs loo at current levels. Here’s a stat from a mum and dad who shall remain nameless, helping out a sibling and partner — their combined income £42,000 — borrowings £200,000 — deposit from generous gifts £76,000 — net result is a loan that is 8X the first income and the valuation on the property is 11X the first salary. I consider HTB to be on the brink of becoming ineffective in continuing the drive house sales — it’s not going to happen — they are going to fall, in price (a lot), and the number of sales is going to fall, (a lot), and the E of the builders is going to fall off a cliff. Mr Woodford is looking at his next Rolls Royce, Capita, Provident Financial etc etc etc. 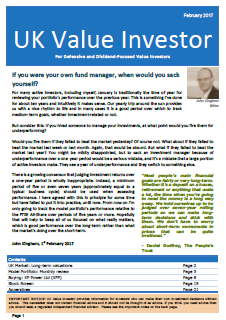 There is an old saying in the investment world — “Buy low, sell High” – perhaps some prefer the reverse? Hi LR, I pretty much agree with all of that.”The Only Way is Up” (Yazz and The Plastic Population – 1988) is not an appropriate theme tune for the housing market. On another topic at the other end of the scale – retailing. Pets at Home — something you might have eyeballed of late John, given it’s dramatic drop from 300p in 2015 to 177 today? – NO CEO — some might view this as a bonus, given the track record of some like the AA – No CEO, no risk of anyone being punched perhaps? – Borrowings of approx £210M — against after tax income of £75M or ratio of about 2.8X – not too stressful. – Net Assets of £880M — although £990M of intangibles. – Positive cash flow – increased cash by £16M last time round after spending £57M on investing — perhaps if this were to slow, the earnings and cash collection would increase dramatically. I’m not a fan of retail or pet shops per se, but this looks like a low entry point. Or should I wait until it’s back up at 300p and get the fund manager’s approval rating? This one isn’t on my radar. It hasn’t been around long enough (only listed on main market since 2011) and I need ten years of data. Personally I like Pets at Home. The local store has rabbits and other fluffy creatures in large enclosures that I used to take my son to see. Although now he’s older we go to Halfords next door and look at bikes instead. Interesting how thing work out. 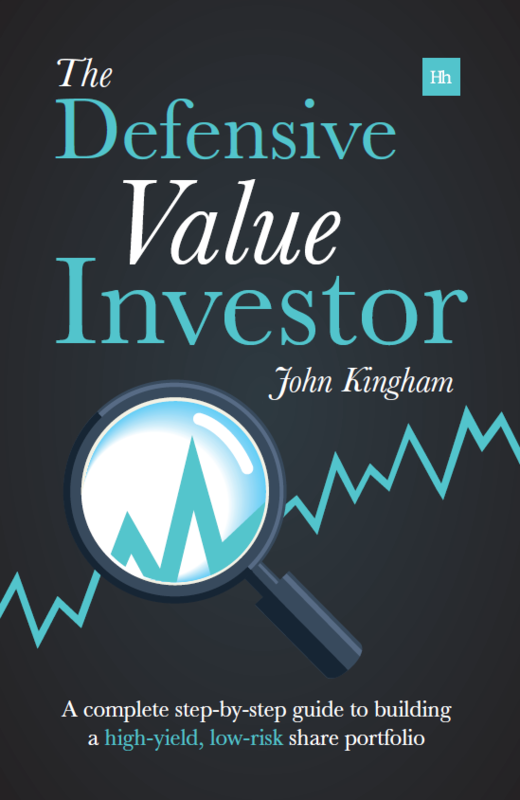 I see today GRFD have fallen from around 1200 to the 800 price mentioned in article as a potential value buy and only after a month or so! Interesting indeed, and probably because the dividend has been cut by 13%. I may have to take a closer look at this company in the near future to see if there area any skeletons in the closet. And perhaps waiting for the full-year results might be sensible as well if the dividend is going down rather than up. I had to smile at their statement that they were reducing the dividend in order to keep the dividend cover at 2X earnings rather than living with the lower cover and trying to increase earnings. Didn’t take long – 800p it is John, down 17% as I type. As I said to George above, I might have to revisit this one and dig a little deeper. It’s raising £150m via a rights issue so that changes things a bit, but this could be a reasonable if high-risk option. As always though, I’m not in any rush and March is a “sell” month for me anyway, so I won’t be looking to buy anything until April at the earliest. Well it seems all hell broke loose, just added to my position at 589p today which gives me a cost basis around 816p. Lots of noise around the Aberdeen bypass and Brexit, however long term I see it as a good dividend growth play.